We’re still waiting for our first Lishou review. Since adding Lishou Slimming Capsules to our inventory, they’ve quickly become one of our best-selling diet pills. 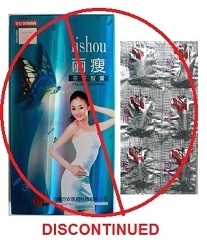 With the recent discontinuation of Fruta Planta, many of our customers with an allegiance to “chinese diet pills” have switched over to Lishou. We encourage anyone who has tried Lishou to leave a Lishou review here. Product reviews assist our customers in making better choices and enhances the overall buying experience. I couldn’t find the fruta planta anymore so I tried Lishou for the first time. I can say that I dont feel hungry just like when taking Fruta. So far so good. I’ve lost 7 pounds in 2 weeks. This entry was posted on Thursday, April 7th, 2011 at 10:28 pm and is filed under New Product Alerts, weight loss. You can follow any responses to this entry through the RSS 2.0 feed. You can leave a response, or trackback from your own site.